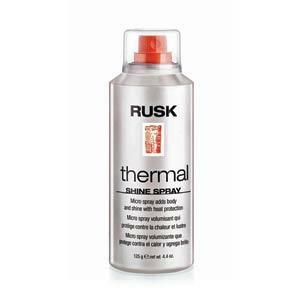 Style Source Magazine | Rusk Thermal Shine Spray 4.4 oz. Home /	Brands / Rusk Designer Collection / Rusk Thermal Shine Spray 4.4 oz. This micro spray adds body and shine to hair without buildup. It soothes frizzy hair and conditions resulting in smooth, straight and sleek styles. Contains Thermplex that provides thermal protection from heat stress caused by daily use of styling appliances.